Take a Journey to BEV'S BLOG!! This is a family safe search! 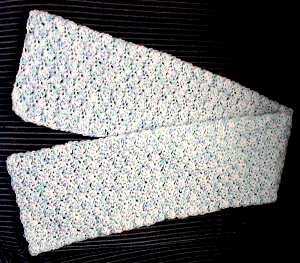 Here is a wonderful warm and pretty crocheted scarf pattern for you to make for family or a charity of your choice. Scarves can warm your neck and upper body, or even be wrapped around your head. They can help save lives. Words in red are corrections to previous pattern. You may make these scarves and sell them. Row 1: Dc in 3rd ch from the hook-counts as 1 dc, 2 dc in same ch, (skip 1 ch, sc in next ch, skip 1 ch, 3 dc in next ch [shell made]) across, 3 dc in last ch, ch 3 and turn. Row 2: Skip 1st st, sc in the center dc of shell, *skip next st, 3 dc in next st, skip 1 st, sc in next st* repeat from * to * across to next to last st- sc in that, ch 3 and turn. Row 3: Make 2 more dc in base of the ch 3, *skip next st, sc in next st, skip next st, 3 dc in next st* repeat from *to* across finishing with 3 dc, ch 3 and turn. Repeat rows 2 and 3 until scarf is 60-65" long (approx. 7" wide), adding new colors as you use up your scraps.